The team of Andrea Borzelli & Sara Berta Architetti have revealed a new design for their client, the Explorer 40M Wide Bow. Working together with Francesco Rogantin, the design pair was inspired by their recent involvement in the military field of design, and set out to create a highly functional, semi displacement yacht with a uniquely developed bow section. The new ‘Wide Bow’ not just serves an aesthetic function, but a functional one as well, increasing the aspect at which swell is deflected by this area and assisting in keeping deck areas as dry as possible. 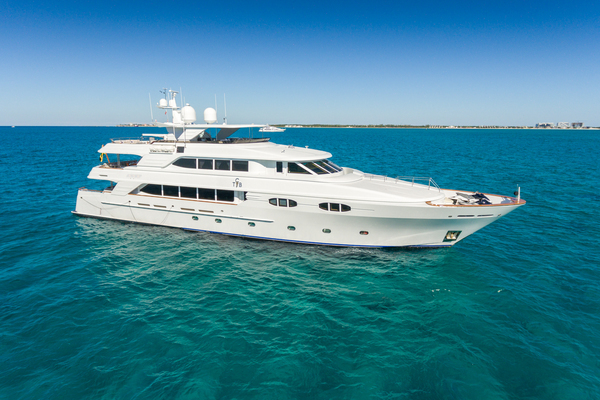 The expansive foredeck offers a good storage options for water toys and deck equipment, with helicopter landing capabilities as well as a glass-bottomed pool that provides light through to the master cabin below. The design team truly wanted to create a superyacht feel on board, not only through the numerous exterior functions and amenities, but also by creating a stylish interior that would keep to the yacht’s functional design. The master cabin forward on main deck is sure to attract attention with balconies on either side of the suite, and a unique view on to the pool placed on the foredeck.